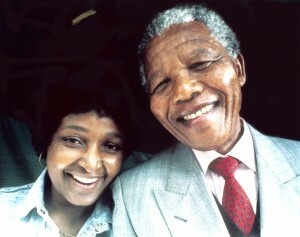 SOUTH AFRICA – JANUARY 01: Former President Nelson Mandela and his wife, Winnie Madikizela Mandela. (TriceEdneyWire.com/GIN) – Tributes to anti-apartheid icon Winnie Madikizela Mandela filled the South African radio air waves this week as news of her untimely passing reached the far corners of the nation and the continent. Heart-rending classics from the American songbook – from The Song for Mama by Boyz to Men to Donny Hathaway’s A Song for You – expressed the somber mood in the nation while social media filled with remembrances by those whose lives she touched – sometimes with a single word, sometimes with a long eulogy. Recently, she was an observer during the ANC’s struggle over corruption allegations that enveloped past president Jacob Zuma. She expressed confidence in the new leadership of the ANC under Cyril Ramaphosa. “We’re going to surprise the country. I’ve told them they must watch this space. I’m back,” she declared. Nomzamo Winifred Zanyiwe Madikizela was one of nine children – six of them daughters – of two teachers and devout Methodists, Columbus Madikizela and his wife, Gertrude. When Madikizela-Mandela moved to Johannesburg, she studied social work. There she met lawyer and anti-apartheid activist Nelson Mandela in 1957 and they married a year later and had two children. The marriage was short-lived as he was arrested in 1963 and sentenced to life imprisonment for treason. Mandela was eventually released in 1990. Winnie was a strong single parent who raised two children while her “larger than life” husband was in prison. This was a time that the ANC and the country overall was “gendered”, spurring her struggle for women’s rights. In May 1969, Winnie was jailed supposedly for political agitation, but more likely for simply being the wife of Nelson Mandela. Held for 17 months, she spent most of the time in solitary confinement, and was interrogated and kept awake for up to five days at a time. The picture of her hand-in-hand with Mandela as he walked free from prison after 27 years became one of the most recognizable symbols of the anti-apartheid struggle. The Mandela family says it will release details of the memorial and funeral services once these have been finalized.